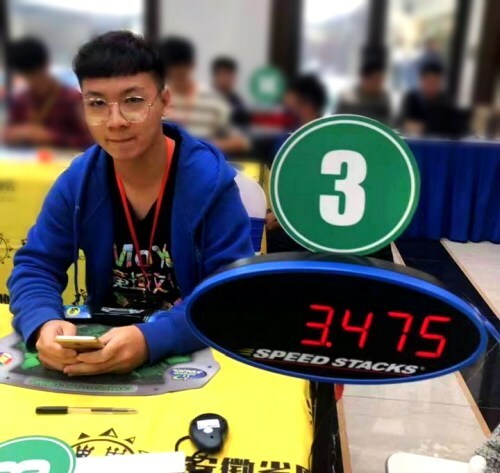 Yusheng Du (杜宇生) shaved off 0.75 seconds from the record of Feliks Zemdegs (4.22s) setting the new Rubik's Cube single World Record at an amazing 3.47 seconds. The Wuhu Open 2018 competition was organized in Wuhu, China on Nov 24 - 25, 2018. On official WCA speedcubing competitions the competitors perform five solves, they drop the fastest and slowest times and average the three times in the middle. His results in the round were 11.13, 3.47, 8.80, DNF and 7.07. This is the reason why, although he set a new world record, Yusheng Du finished third on this competition with an average of 9 seconds. Antoine Cantin (7.87) and Kaijun Lin (8.21) were both a little faster. The first Sub-5 (under 5 seconds) record was achieved by Lucas Etter 3 years and 3 days ago. The first Sub-4 is definitely a huge surprise because the previous 4.22s record by Feliks Zemdegs seemed to be unbreakable and it was expected to be standing for years. Then comes a relatively unknown cuber who has never solved the cube under 6 seconds on a competition and beats it with 3/4 seconds with the very first official Sub-4 ever. Yusheng Du is currently the 60th best cuber on the World, according to his average 3x3 record. 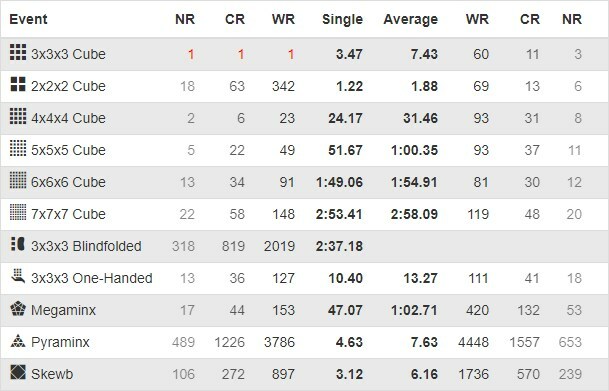 Current records by Yusheng Du. He used the CFOP method to solve the cube. See the steps and play back the animation below. Unfortunately nobody was recording the solve, all we have is the surveillance video of the competition room, published on Yusheng Du's YouTube channel. Besides having great skills, you also need luck to achieve such an incredible time. Similar results have been achieved by just a few cubers at home while practicing. The fact that this happened on an official competition is truly amazing. Just like every other record that seemed unbreakable, one day this one will be broken as well. The best cubers solve the first two layers in approximately 3.5 seconds. The chance of an LL-skip is 1 to 15552. Last Layer Skip is a very lucky case when the cube comes together as solved after the completion of the first two layers. This means that this record can be broken but it requires a very good cuber and luck. Evolution of World Records since 2004. Lucky scramble? Maybe. But luck itself has no sense if you cannot deal with it properly. Congratulations and I hope to see many Sub-4s in the future!